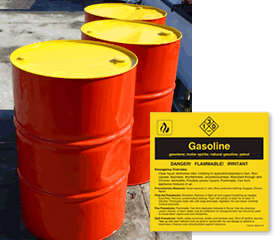 To label chemicals in your bins and drums nothing works better than bold ANSI Chemical Labels. These ANSI chemical labels contain the exact, official hazard warnings including the emergency overview, precautionary measures, and first aid, fire & spill procedures. We offer over 130 pre-printed labels representing the most common chemicals. You won't find chemical Labels more durable and for a better price than these. • Chemical Labels come in 4" x 4" and 6" x 6" options. Both sizes are offered in paper (more economical) and plastic vinyl (more durable) material. Want to order a chemical label that we don't sell? You can easily create your ownl using our online custom wizard. • 1,1-Dichloroethane, 2-Butanol, Acetone, Acetonitrile, Acrylamide, Acrylic Acid, Acrylonitrile, Adipic Acid, Aluminum Powder, Aluminum Sulfate, Benzyl Chloride, Beryllium Powder, Boric Acid, Bromine & many more! • Cadmium Powder, Carbon Black Powder, Carbon Dioxide, Carbon Disulfide, Carbon Monoxide, Diesel Fuel Oil No. 2-D, Diethylamine, Dimethyl Sulfoxide, Dimethylformamide, Ethanol, Ether, Fuel Oil & many more! • Gasoline, Glacial Acetic Acid, Glutaraldehyde, Glycerol, Helium, Hydrochloric Acid, Hydrogen, Hydrogen Peroxide (30%), Hydrogen Sulfide, Iron Powder, Isobutylene, Kerosene, Lactic Acid, Lead & many more! • Oxygen Gas, Ozone, PCB's, Phosphorus, Potassium Cyanide, Propane Gas, Silver Powder, Sodium, Sodium Hydroxide, Sulfur Dioxide, Sulfuric Acid, Tetrahydrofuran, Titanium Powder, Toluene, Xylene & many more!